Last week it was Cuban food, this week it is Ethiopian food. Who knows what next week will bring? Tonight I headed up north again with Bryan and Katie to expand my palate once again with my first taste of Ethiopian food. The two of them have been to this place several times before and said that the food here was excellent. Upon walking inside the restaurant, the décor definitely had an Ethiopian feel to it, with the patterns stitched onto some of the chairs and some of the pictures that they had hanging up on the walls. For a Friday night, however, the restaurant seemed kind of on the empty side. Then again, not sure if the students from nearby Rutgers University usually help to boost the business, but if that’s the case, the summer is the slump of the year. Looking at the menu when choosing what to order, I found it interesting to see that with this cuisine (similar to the Cuban cuisine I had at Cuban Pete’s) also takes basic ingredients and enriches them with great flavor a variety of spices that are local more to that region of the world. They utilize base ingredients of meat and poultry such as chicken, lamb, and beef, and add in vegetables such as green peppers, tomatoes, and onions. I am by no means well versed in Ethiopian cuisine, but this was a great learning experience for me and showing me what flavors of food are like in that part of the globe. For each plate of food that you order, you choose your primary dish along with two vegetable portions that are served next to it. All of the food is served with injera, which is a flatbread with a sponge-like texture. The injera is made with teff flour, which is harvested from grass that is native to the northern Ethiopian highlands. For my main dish, I went with the zilzil strips, pieces of lamb that were marinated in Ethiopian honey wine, garlic, and onions and fried in some seasoned butter. For my two vegetable dishes, I went with the ful (Ethiopian beans that were cooked with tomatoes, onions, hot green peppers, and a bunch of spices) and the atakilt wat (green beans, carrots, potatoes, peppers, and onions sautéed with garlic and tomatoes). 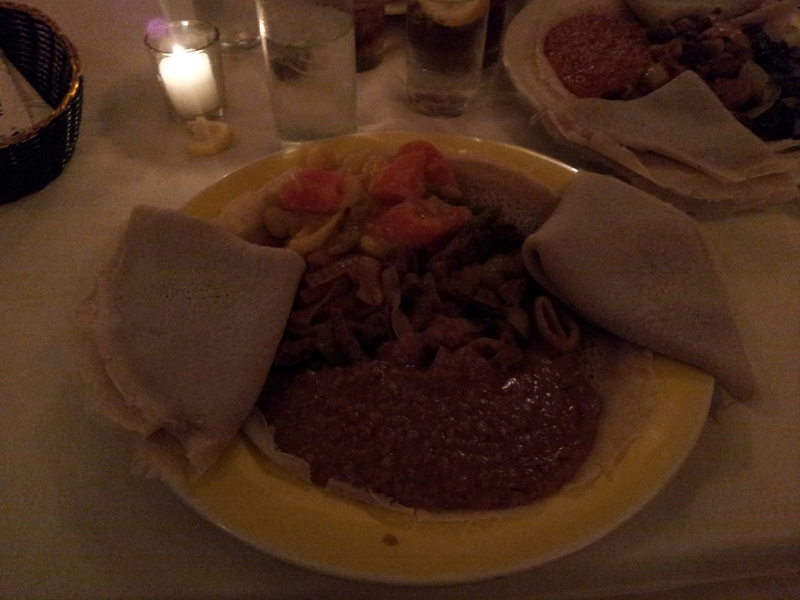 And of course, the unlimited injera served on the side. I’m sure that my well-lit photo of the food above is a great reference to what everything looked like. Also, none of the dishes came with utensils, because you are supposed to use the injera to pick up everything and eat it (similar to how naan is to Indian cuisine, I believe). I think that I enjoyed the vegetable dishes more than the lamb dish, primarily because the flavors jumped out at me more. I was very impressed with the ful, very rich in the spices and also at the heat level (which I wasn’t expecting). All of the added vegetables with the beans gave it a very hearty flavor, and the spice helped to differentiate it. The atakilt wat also had very rich flavors, and from my understanding, is a version of stewed vegetables. It was still kind of funny to try picking up some of the larger vegetables with the spongy injera and pretty much shoving it all into my mouth (I’m sure that it was a pleasant sight to behold). My lamb came out a little on the chewy side, but the peppers and onions that paired with it still came out to taste great. I’m very happy that I went because it gave me exposure to some food that I usually don’t have the opportunity to try. In my next visit to an Ethiopian restaurant, I’ll now be more keen as to what items to look for on the menu. 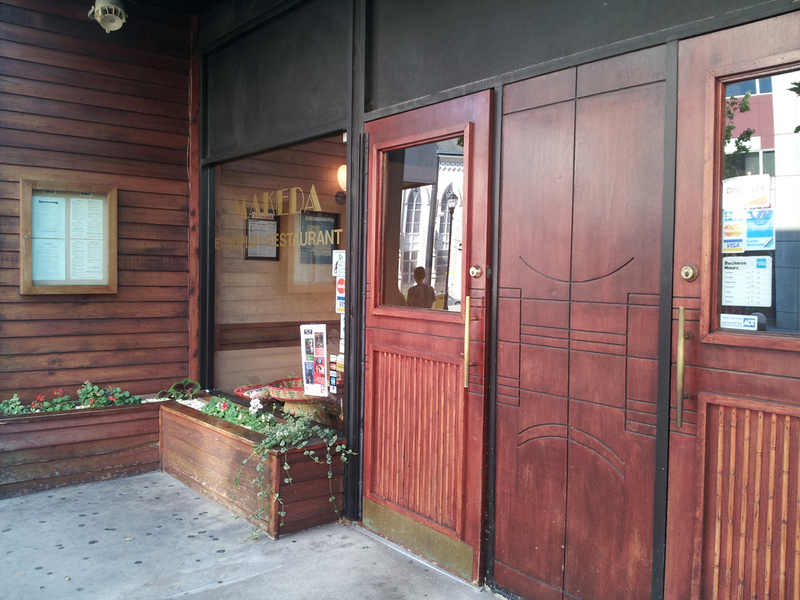 Makeda is a good place to get a first-time start with such a flavorful and hearty cuisine. The food tasted great with all of the spice blends, and there is a lot of variety on the menu to offer up something for everyone. The decorations were really nice and the mood was set with the darker lighting. The service was a little lacking at times during the meal. When we first walked in, we were not really sure if we were to head straight into the dining room. A waitress who had mentioned she was setting up a table for us had left her shift and didn’t notify us. However, the water was filled promptly and empty dishes were taken away regularly. The food didn’t take too long to arrive, either. This is an expensive place to eat, and there’s no denying that. However, I felt like for the price of the food (and the suffering of my wallet) it wasn’t as filling as it should have been. My dish cost right around $30, but I would have definitely been more comfortable paying around $22 or $24 instead.